Our Recent Addition in Circle C Ranch Proves That Change is Good! 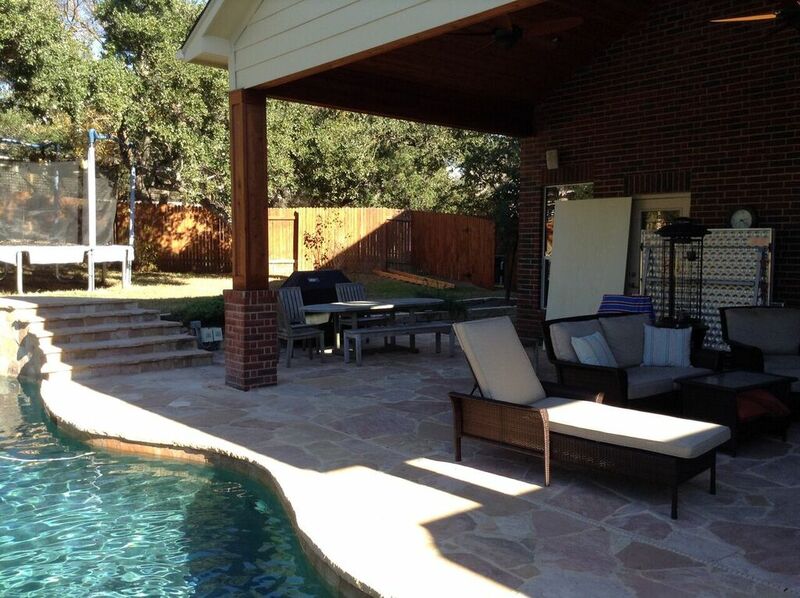 This week’s featured project story takes us back to Circle C Ranch in South Austin, TX, where we totally transformed an existing backyard poolside patio and increased the aesthetics of the existing pool surround. Transformed outdoor living space in Circle C Ranch, from a cramped hot pergola to a comfortable and spacious covered porch! When our talented lead outdoor living space designer, Jim Schallon, initially met with these Circle C Ranch residents they expressed their dilemma of not having enough room, or shade, to fully enjoy their existing backyard space. The space consisted of a pergola that was built atop their backyard patio that lacked space or harmony, and offered very little shade value. With these considerations in mind, Archadeck of Austin came up with a new design that transforms the look, feel and function of this South Austin backyard! 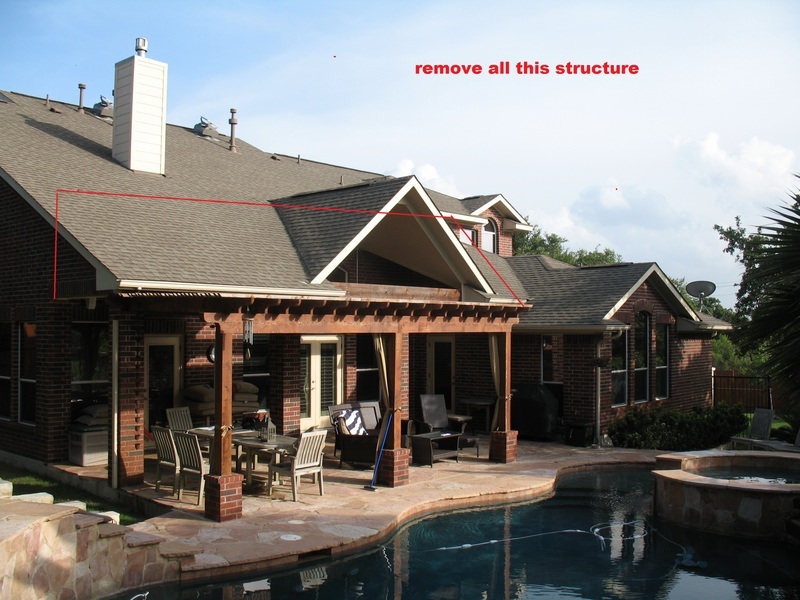 The entire project included removal of the existing pergola, including the original support columns, and building a new patio cover which extends further and wider than the previous outdoor space. The new space adds more outdoor living area, plenty of shade and is easily accessible from three entrances into the home. The original space only provided covered accessibility to two of three interior doors that provide entry onto the patio. In order to build the design according to plan, removal of the entire rear brick facade of the home was necessary. We carefully rebuilt the entire back brick facade paying special attention to match the exterior to the original, we also constructed the new brick support columns using the same masonry color and style. 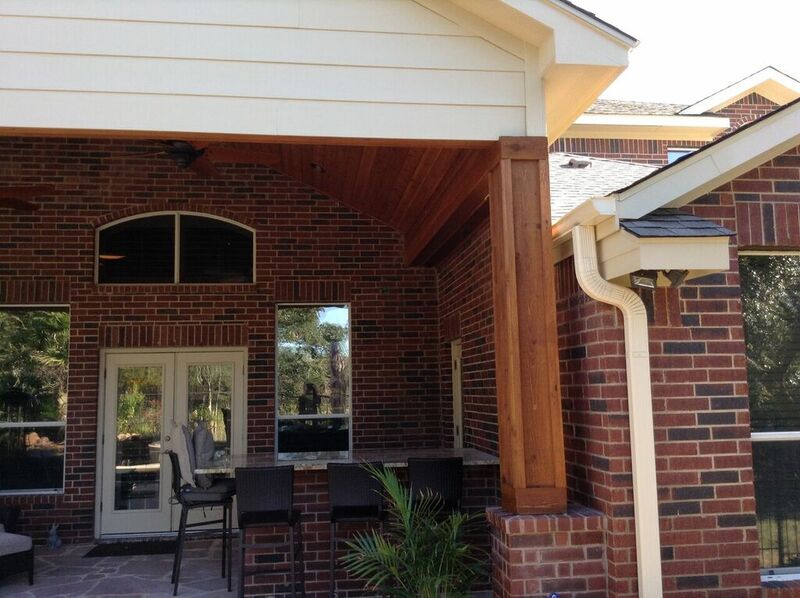 These columns were then topped off with Western red cedar posts to blend with the beautiful cedar tongue & groove ceiling on the inside of the patio cover. Along with the rustic beauty of the cedar details, the interior of the new transformed space includes an “eat in” style bar area that serves a myriad of uses; from outdoor dining to entertaining guests poolside. The new addition allows plenty of natural sunlight to reduce the chances of light being lost on the areas inside the home with Velux skylights installed into the ceiling of the new space. We also included plenty of recessed lighting and three ceiling fans to help air circulate on those balmy South Austin afternoons. The improvements to this backyard did not end with the patio cover. 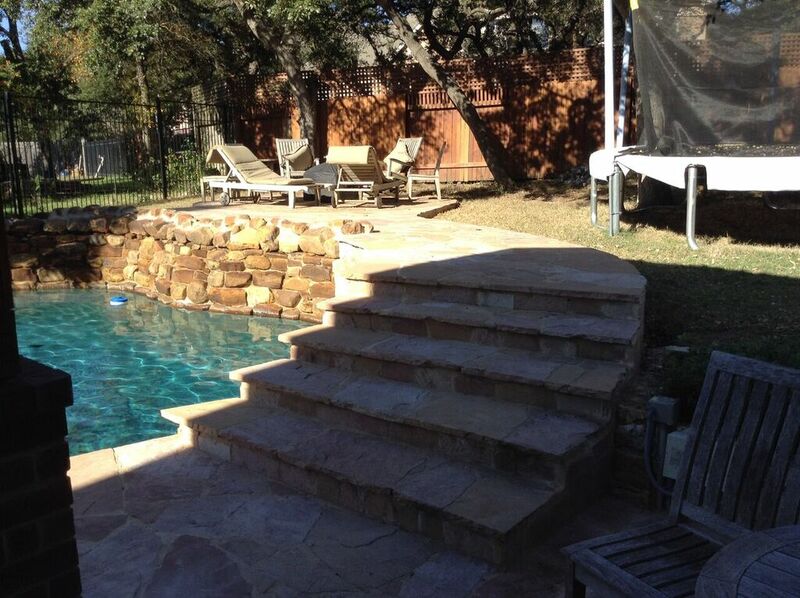 Archadeck of Austin took this project a step further by improving the flow and tranquility of the homeowner’s backyard pool by unifying the addition from the top of the stairs behind the pool. 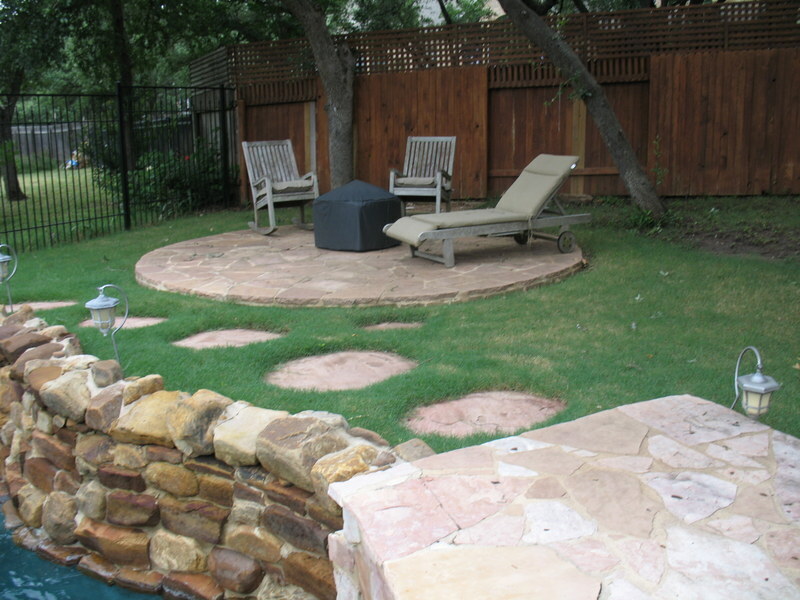 We made sure to match the flagstone we used for this integration to the existing flagstone original to the area. The whole area now flows together as one, fun and relaxing outdoor room! 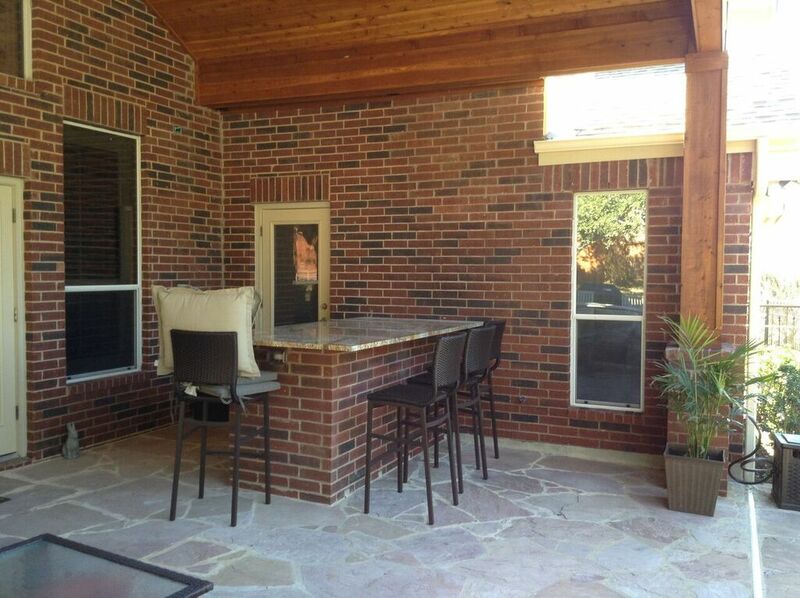 The completed project has totally changed the way the homeowner’s use and enjoy their backyard. This transformation was certainly a change for the better. 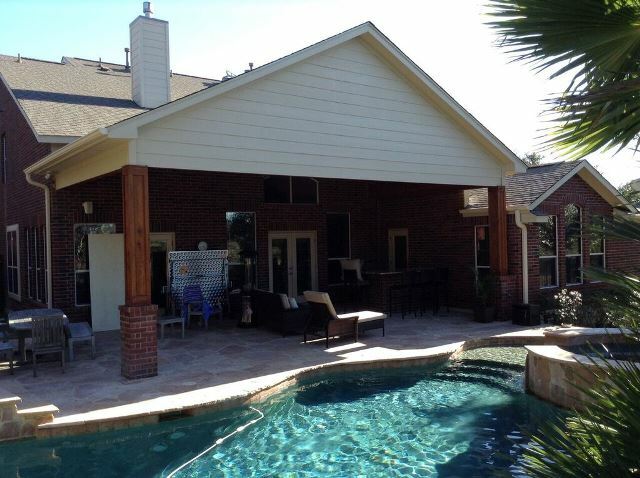 If you have an existing outdoor space that is no longer functional for your current needs, or if you are ready to build the outdoor living space you have always dreamed of, contact Archadeck of Austin to get started on your outdoor living space project today. You can reach us by phone at (512) 259 – 8282 or via email at jim.odom@archadeck.net. 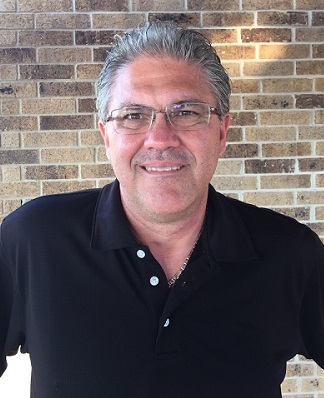 This entry was posted on January 6, 2016 by austinporchandpatio. It was filed under Archadeck of Austin, Austin outdoor bar, Austin patio cover, Covered patio Austin, Covered porches, Flagstone, Flagstone Patios and was tagged with Archadeck of Austin, Archadeck of Austin design, Austin covered patio, Austin covered porches, Austin custom covered patios, Unique patio designs Austin TX, Velux Skylights.